Madhavi Ajit Sawant from Virar, B.Sc Graduate. 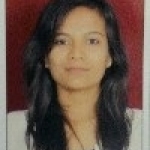 Madhavi Ajit Sawant is IT Fresher and currently have no work experience. HTML & CSS AND MS OF.. ASP .NET C# SQL SOFRWARE TESTING SALES BACKOFFICE OPERATION..
are one of expert skill area's of Madhavi Ajit Sawant . Madhavi Ajit Sawant is working in IT Software industry. HTML & CSS AND MS OF..